The outcome of the Gujarat polls would be interpreted in terms of Rahul Gandhi's ability as a campaigner and vote-getter. 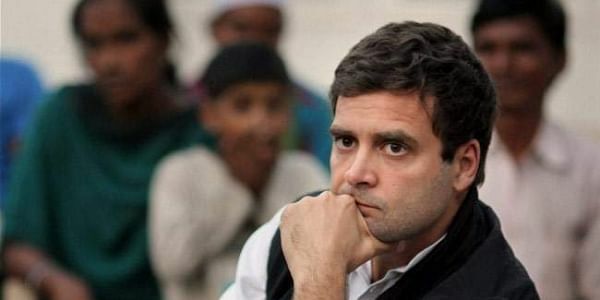 NEW DELHI: Rahul Gandhi's long-delayed elevation as party chief is almost over as he was on Monday elected Congress President at a time when the party is facing an "existential crisis". His main challenge remains the revamping of party organisation, apart from electoral battles in the run-up to the 2019 Lok Sabha polls. Gandhi will formally take over the reins of the grand old party on December 16, two days before the counting of votes for Gujarat and Himachal Pradesh assembly elections, the outcome of which could be a trendsetter ahead of the 2019 Lok Sabha election. Gandhi, 47, who would take over from his mother Sonia Gandhi who had helmed the country's oldest party for 19 long years, will be the sixth member of the Nehru-Gandhi family to take the top position of the 132-year-old party. The outcome of the Gujarat polls would be interpreted in terms of Rahul Gandhi's ability as a "campaigner and vote-getter". The next round of assembly polls in 2018 -- first in Karnataka and later in Madhya Pradesh, Rajasthan and Chhattisgarh -- will be very crucial for Gandhi in order to build the momentum to take on Prime Minister Narendra Modi in the Lok Sabha polls. The state elections, with Bharatiya Janata Party as the key rival, will also be the first major polls directly under Rahul Gandhi's charge as party chief. Assembly polls will also be held early next year in Meghalaya, Nagaland and Tripura. The challenges for Rahul Gandhi include infusing fresh energy and life in Congress workers and evolving a proper strategy to galvanise the party, following a string of electoral losses since the 2014 Lok Sabha debacle. Gandhi has to be decisive on forging a larger opposition alliance for the 2019 Lok Sabha polls under a "collective leadership" or even projecting himself as the alternative to Modi with the support of different parties. Gandhi has always been perceived as a reluctant politician due to some of his longish trips abroad, which delayed his stepping into the role of party chief. His action not to take up ministerial responsibility in two UPA governments and not properly following through some of the issues he raised drew strong criticism. He has been able to counter those perceptions to some extent with his sharp and aggressive attacks on Modi and the BJP. His recent trip to the United States, where he held interactions with think tanks, has brought about a sea change to his overall image. In Gujarat, where success will be a big morale-booster for the Congress, Gandhi has sought to create a broad social coalition and has forced Modi to react. Reviving the Congress in Uttar Pradesh is going to be another major challenge for Rahul Gandhi -- the state that sends the largest contingent of 80 members to the Lok Sabha. The results of the local body polls in Amethi and Rae Bareli, the Lok Sabha constituencies of Rahul Gandhi and Sonia Gandhi respectively, have not given a fillip to Rahul Gandhi's image. Rahul Gandhi had been projected as a young leader who understands the language and pulse of the youth but Modi has been more successful in weaning away the section that has large electoral presence. The Congress also has to devise ways to woo the large middle class. He needs to act smartly in his dealings with allies and other opposition parties, including the Communist Party of India-Marxist. Within the party, Gandhi has to take several decisions, including whether to project chief ministerial candidates in poll-bound Madhya Pradesh, Chhattisgarh and Rajasthan and who they are going to be. To bring about unity in faction-ridden state units and striking the right the balance between the "old guard" and the younger aspirants will be his other challenges. The Congress is ruling now in five states and a union territory only and a loss in Gujarat as well as in Karnataka next year will further put a squeeze on its chances of staging a comeback at the Centre in 2019. Gandhi, who is into his third term as Lok Sabha MP, was made Congress Vice President in 2013 as a stepping stone to his eventual elevation to the top party post. Since 2004, Rahul Gandhi has been the Lok Sabha member from Amethi in Uttar Pradesh. In 2007, he was named Congress General Secretary in charge of youth and student wings of the party. He has attended St Stephen's College, Delhi, Harvard College and Rollins College, Florida, from where he graduated with a Bachelor's in Arts. He received an M. Phil in Development Studies from Trinity College, Cambridge University. Thereafter, he joined the Monitor Group, a strategy consulting group, in London, where he worked for three years.